When it comes to warm hosts, the men and women from Indigenous communities around British Columbia are experts. For them, whales, grizzly bears, rivers, artwork, and good food are not just recipes for a successful vacation – it’s a cherished way of life. 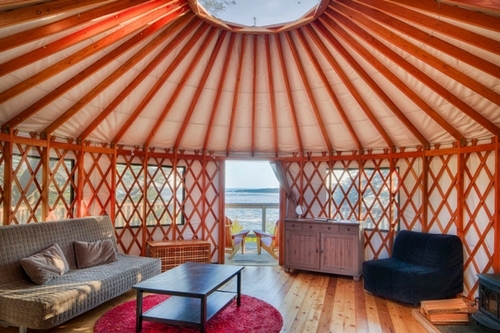 If you’re looking for a getaway that has everything from crazy ocean experiences to forest meditation, head west and immerse yourself in Indigenous culture and be amazed. Here are 10 unique experiences to consider. 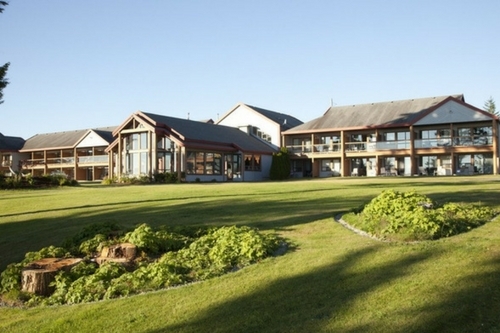 Members of Indigenous Tourism BC operate all of these lodges, hotels, and resorts. How’s this for a unique stay? Head to the ancestral lands and traditional territory of the Kitasoo/Xai’xais First Nation peoples and explore the natural habitat of the world’s only Kitasoo Spirit Bear Conservancy. 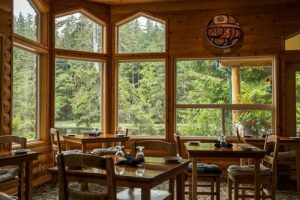 Located in Klemtu, Spirit Bear Lodge offers four to seven day tour packages in the heart of the Great Bear Rainforest on BC’s wild coast. At Spirit Bear Lodge, education becomes part of your vacation experience. See the rare Spirit bear and majestic Grizzly while viewing petroglyphs and totem poles. Enjoy the hatchery and when the day is over, kick back and relax in the lodge, where each room comes with a king size bed, private bathroom and jaw-dropping views. 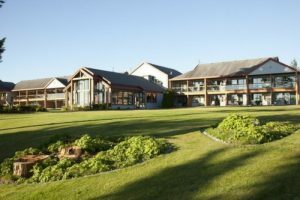 Located on the majestic Mackenzie Beach off British Columbia’s Clayoquot Sound, the Best Western Tin Wis Resort has a wide variety of activities for all ages. If you love hiking, bear watching, shopping, or just relaxing over an excellent meal Best Western Tin Wis is where you need to be. 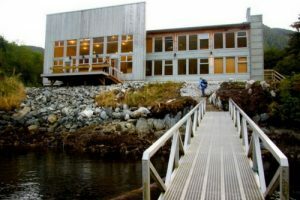 Located just four kilometers from local galleries, shops, and culinary delights, this full service Tofino hotel is owned by the Tla-o-qui-aht First Nation and features well-appointed guest rooms, each fully equipped with a 37-inch TV, high-speed wireless internet, and a gorgeous view of the ocean. For visitors who love the water you won’t go wrong at Best Western Tin Wis. Whale watching tours, hot springs, deep-sea fishing, paddle boarding and kayaking are just a handful of activities that will leave you breathless. 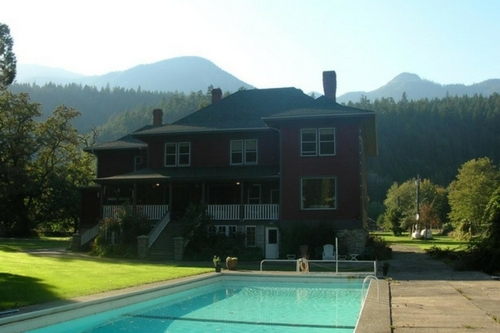 Sasquatch Crossing Eco Lodge, located in Sts’ailes, a 20 minute drive east of Chilliwack, features comfortable accommodations with warm and inviting hosts ready to share their lovely eighty-seven acre property featuring peaceful trails and places to meditate. 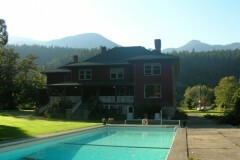 This gem features a secluded waterfall that provides green energy to the property 10 months of the year. At the end of the day, settle down in one of nine guest rooms. 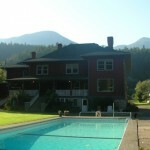 Sasquatch Crossing Eco Lodge offers complimentary breakfast to overnight guests and catering options for groups six to 20 for breakfast, lunch, and dinner. Camp, fish, watch birds, or just gaze at the stars with friends and family at Cluxewe Resort, located in the land of the Kwakiutl people on the north end of Vancouver Island. Activities include golfing, birding, wildlife viewing, kayaking, hiking, and a grizzly tour. 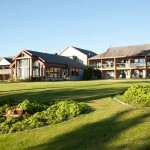 When the day is over, head for the Cluxewe Waterfront Bistro and a mouth-watering new menu. 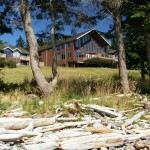 Stay in one of the cottages and relax as you listen the Pacific Ocean crash gently into the shoreline. Feeling more adventurous? Get outside! A unique feature of Cluxewe Resort is the camping, featuring 147 sites ranging from tent only to full and partial hook ups for campers and RVs. 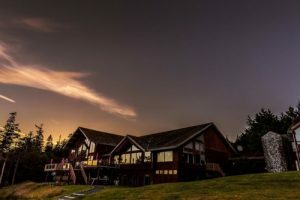 Whether your interest is hiking, sitting back, and enjoying the stars or savouring a delicious meal, Wya Point Resort will appeal to the keen traveler seeking a unique experience. 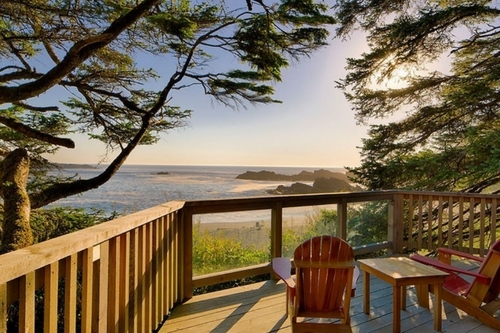 Located in Ucluelet, Wya Point Resort offers lodges, yurts and camping experiences, fishing charters, whale watching tours, and the Ucluelet Aquarium. With secluded sandy coves, clear water and hidden rock pools, the beaches at Wya Point provide endless recreational fun. Get acquainted with the Ucluelet First Nation (also known as the Yuu-tluth-aht First Nation) and immerse yourself in their living culture in a beautiful setting. Located on Quadra Island, a 10-minute ferry ride from Campbell River, Tsa-Kwa-Luten lives in a region teeming with life, Indigenous history and a strong spiritual presence. Created by the We Wai Kai Nation, this lodge offers authentic Pacific Coast native architecture, art, and culture based on traditional Kwagiulth historical values. When evening arrives, enjoy a varied selection of gourmet west coast cuisine. All dining areas offer spectacular mountain and ocean views and if you are visiting on a Wednesday be sure and stick around for Prime Rib Night. 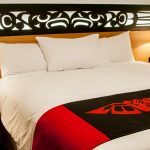 Hotel Meaning ‘place to sleep’ in the Gwa’sala Nakwaxda’xw language, Kwa’lilas Hotel offers exceptional dining and activities in the breathtaking landscape of North Island. Situated on the eastern tip of North Vancouver Island, Port Hardy is an eye-candy feast of mountain ranges and pristine forests. See marine mammals such as whales and sea lions on a Scenic Boat and Wildlife Tour, participate in Drum Making, Cedar Weaving or check out the Port Hardy Museum. When the sun goes down and the stars come out, feast on an Indigenous-inspired west coast cuisine that is always served daily in the restaurant. 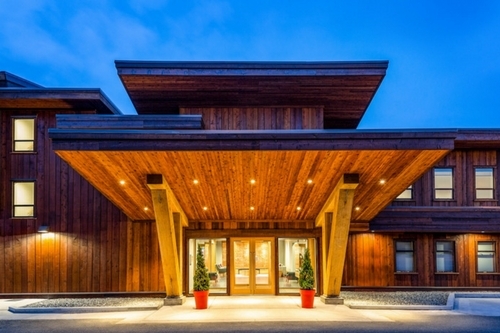 This lodge brands itself as the First Name in Fairly Traded First Nations Art. 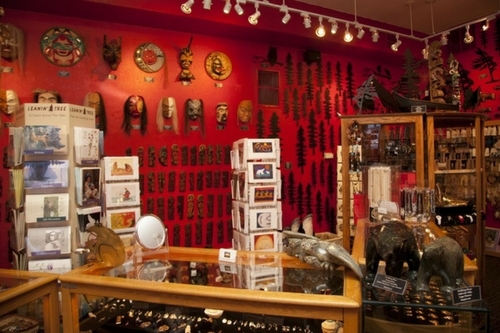 Himwitsa Native Art Gallery has award-winning fairly traded masks, carvings, and jewelry. The House of Himwitsa is the ultimate shoppers paradise, where you can purchase items that will bring life to your home and gifts that will thrill family and friends. Speaking of shopping, be sure to check out the Dockside Smoked Fish Store for a wide variety of tasty treats before heading home. Items include Wild Smoked Sockeye Indian Candy, Wild Smoked Chum Honey Garlic, Lobster Pâté, and Estevan Solid White Albacore Tuna in extra virgin olive oil. When you are finished discovering what the art gallery and fish store has to offer, head for one of four spacious suites at Himwitsa, with fluffy queen-size beds and a jaw-dropping view of Clayoquot Sound. 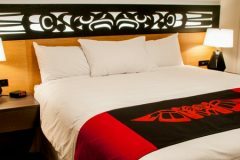 Proudly 100% Haida owned, Haida House at Tlaal offers everything you need for a thrilling fall vacation on Canada’s west coast. Lose yourself in this stunning region known as the “Island of the People.” Ancient rainforests with pristine rivers will soothe your soul and awaken your senses. Unique packages are available at Haida House at Tlaal, including alpine adventures and helicopter tours. 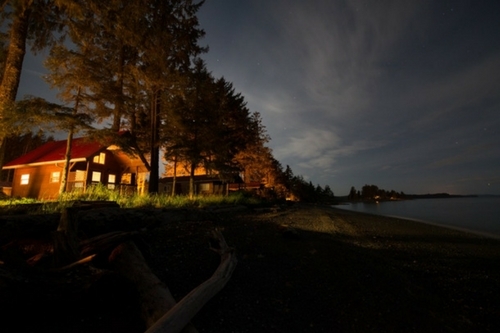 At the end of the day enjoy a traditional Haida tapas-style meal with local seafood, game meat and forest harvests. Located in Tow Hill in Haida Gwaii, Hiellen Longhouse Village features traditional Haida style cedar, hemlock and spruce longhouses that provide comfortable accommodations that can easily sleep four. Owned and operated by the Old Massett Village Council’s Economic Development Team, this pet-friendly stop has a gas stove top, an outdoor BBQ and a wood-burning fireplace. 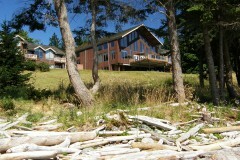 Visitors can hike to Tow Hill, Explore beautiful Naikoon Park or rent a car and explore Haida Gwaii.